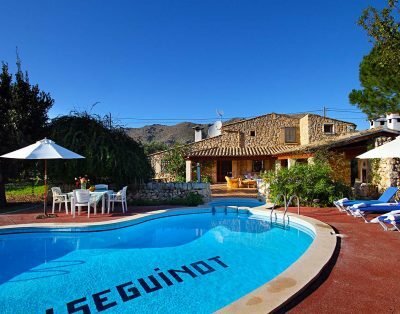 Only a few meters from the quiet beach “Llenaire” in Puerto Pollensa you find this outstanding Villa in a very quiet residential location called Llenaire.The property is surrounded by a fantastic swimming pool and a big grass garden with lots of plants and flowers. The house looks modern and contemporary from the outside. The typical mallorcan stones that cover some of the walls give a contrast to the wooden top area of the villa. The outside doesn«t reveal the big interior house. Past the pergola entrance there is an impressing hall that leads to the sitting room at the front, to the first floor at the left as well as to a bedroom. The big spaces of the house and the luxury furniture can be apreciated already here at the entrance. The biggest room in the house is the sitting room (to the left) and the living room (to the right). The windows give a view of the terrace and the pool outside. Next to the living room with a stylish glas table, a corridor leads to the kitchen, a very nice furnished with an island in the center. Behind the kitchen there is the laundry and the machine room. In this corridor there is the door to the second bedroom in the ground floor, a very imposing double bedroom with direct access to the swimming pool. Getting to the first floor, a corridor leads to the three bedrooms here, a small multi-purpose space as well as a door to the backward terrace. The first cozy bedroom has a double bed, a small terrace and a bath with whirlpool. The main bedroom is really a big space with access to the big terrace. The spacious bathroom is equiped with a shower and a whirlpool. The third bedroom here has a very nice shower bath and is a twin bed bedroom. Some of the highlights that show the luxury of this new build modern, spacious house are: Air conditioning and heating floor in all the rooms, a big swimming pool and two whirlpools. Internet access and satelite tv. Lurury equipment in bathrooms and floors. Very quiet situation at 100m from the quiet llenaire beach. Absolutely outstanding, wonderful property and fantastic service. We spent a family week at Casa Linda and were absolutely thrilled with the villa. It is excellent accommodation - beautiful luxury but comfortable and with everything you could possible need. Domingo was a pleasure to deal with too and extremely helpful before and during our stay. 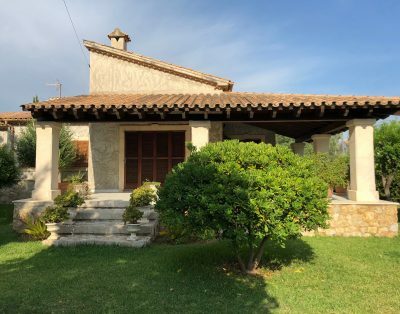 The villa is even bigger and better than the pictures suggest. Great location too - an easy walk to the beach and town but quiet and peaceful. Thank you Domingo and Orlinda! - Suberb villa, lots of luxury details. - Enough amenities for everybody. Just relax.